by LaVeist, Thomas A.; Isaac, Lydia A. 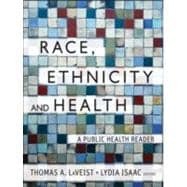 Race, Ethnicity and Health, Second Edition, is a new and critical selection of hallmark articles that address health disparities in America. It effectively documents the need for equal treatment and equal health status for minorities. Intended as a resource for faculty and students in public health as well as the social sciences, it will be also be valuable to public health administrators and frontline staff who serve diverse racial and ethnic populations. The book brings together the best peer reviewed research literature from the leading scholars and faculty in this growing field, providing a historical and political context for the study of health, race, and ethnicity, with key findings on disparities in access, use, and quality. This volume also examines the role of health care providers in health disparities and discusses the issue of matching patients and doctors by race. There has been considerable new research since the original manuscript's preparation in 2001 and publication in 2002, and reflecting this, more than half the book is new content. New chapters cover: reflections on demographic changes in the US based on the current census; metrics and nomenclature for disparities; theories of genetic basis for disparities; the built environment; residential segregation; environmental health; occupational health; health disparities in integrated communities; Latino health; Asian populations; stress and health; physician/patient relationships; hospital treatment of minorities; the slavery hypertension hypothesis; geographic disparities; and intervention design. Thomas A. LaVeist, John M. Wallace Jr.